Emerson Electric Co., a diversified global technology company, engages in designing and supplying product technology and delivering engineering services to various industrial and commercial, and consumer markets worldwide. The company operates through five segments: Process Management, Industrial Automation, Network Power, Climate Technologies, and Appliance and Tools. The company is member of the S&P 500 and the S&P Dividend Aristocrats indexes. Emerson Electric Co.has paid uninterrupted dividends on its common stock since 1947 and increased payments to common shareholders every year for 52 years. From the end of 1998 up until December 2008 this dividend growth stock has delivered a negative annual average total return of 4.90% to its shareholders. The stock is down over 50% from its 2007 and 2008 all-time highs. The company has managed to deliver an 8.40% average annual increase in its EPS between 1999 and 2008. Analysts are expecting an increase in EPS to $2.35 for 2009 and $2.20 by 2010. This would be a decrease from the 2008 earnings per share of $3.11. The economic crisis is currently affecting the St. Louis based company, which recently announced a 25% decline in orders for the past three months. Emerson Electric does expect to restructure its operations in order to make them more cost effective. In addition to that the relative diversification of its revenue sources by continents and five major business segments should soften the fall in earnings. Another positive for the company is the fact that it focuses on new product introductions, which could add greatly to profitability. Strategic acquisitions could also add to the bottom line as well. 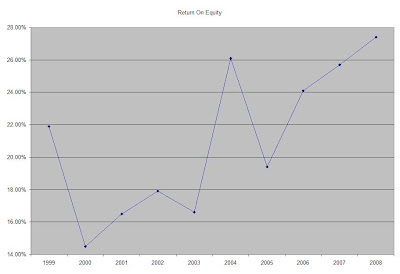 The Return on Equity has increased over the past decade from 22% in 1999 to 27% in 2008. The reason for the increase is managements implementing capital efficiency initiatives after a string of acquisitions. Rather than focus on absolute values for this indicator, I generally want to see at least a stable return on equity over time. Annual dividends have increased by an average of 7% annually since 1999, which is slightly lower than the growth in EPS. A 7 % growth in dividends translates into the dividend payment doubling every ten years. If we look at historical data, going as far back as 1982, Emerson Electric Co. has actually managed to double its dividend payment every nine years on average. Despite the expectations for lower earnings and revenues for 2009 and 2010, I believe that the dividend payment would not be affected. The worst that could happen is that dividend growth slows down for the next two years, before resuming its 7% annual rate of increase. Despite being regarded as a cyclical company Emerson has raised distributions for over half a century, so a recession should not create a steep shift in the company’s dividend policy. The dividend payout ratio remained below 50% for the majority of the past decade. The only exception was the 2001-2003 period, when profitability suffered from the economic downturn at the time A lower payout is always a plus, since it leaves room for consistent dividend growth minimizing the impact of short-term fluctuations in earnings. Currently Emerson Electric Co. is trading at 13 times earnings and yields 4.00%. I believe that Emerson Electric Co.is attractively valued at the moment. I would be looking forward to adding to my position there.